As policymakers gear up for party conference season it is interesting to note that, despite the over-riding focus on Brexit, there are plenty of fringe events taking place based on the question of housing. Delivering enough houses for a growing UK population remains a key concern, and an issue for MPs who are looking to the next election. Average UK price growth remains steady, although as the map below shows, the market remains regionalised. The data from the ONS HPI in the year to July shows a slightly higher average growth of 8.3% compared to 5.6% from Nationwide. 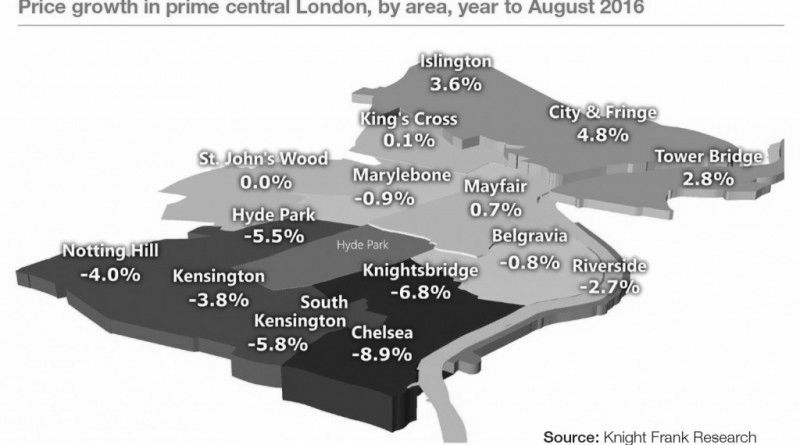 Property prices in prime central London fell by 1.8% over the year to the end of August, according to the latest index from Knight Frank. Despite prices declining, there are grounds for cautious optimism that activity will pick-up over the next few months. In the eight weeks following the referendum, the number of new prospective buyers rose 22.1% compared with the same period in 2015. The number of properties under offer rose 19%, while viewing levels increased by almost half. However, stamp duty reforms continue to have a sizable impact on demand and transactions across the capital, something which is explored further in the London Review. In the prime country house market annual growth eased to 1.3% in the year to the end of June, down from a high of 5.2% in 2014, but several key urban markets outperformed this growth. Prime price growth was 9.1% in Winchester, 8.6% in Cheltenham, 7.4% in Bristol and 4.8% in Bath during the year. Key to the outperformance in these towns has been good transport links, good schools and amenities.